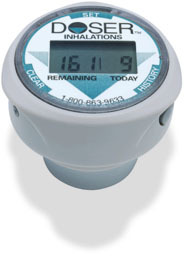 • Displays the number of inhalations remaining in the inhaler.· Three "beep" alert informs user that fewer than 20 inhalations remain in the canister. • Those with respiratory conditions, and the parents of asthmatic children, can avoid being caught without medication. • Displays the number of inhalations taken during the current day. • Enables easy monitoring for better self care. Makes following doctors' instructions easier, especially for those on daily medication. • Parents can better monitor children's medication usage. • Stores up to 30 days usage history in a separate memory, which can be reviewed at any time, with the press of a button. • Healthcare professionals are able to accurately monitor their patients' compliance with preventative medication, and the over/under use of rescue medication. * Except Atrovent and Tilade. © 1999 MEDITRACK Products. All rights reserved. This web site published by ElectroMagnetic Solutions.